CHATTAHOOCHEE HILLS, Georgia—The National Endowment for the Arts (NEA) awarded AIR Serenbe a $10,000 Art Works grant towards the artist residency's 2018 program, Here Say. Here Say gathers the country's top artists using speaking as performance for a series of creative roundtables and public performances in Metro Atlanta. From spoken word and storytelling to lectures and rap (and everything in between), Here Say invests in the development and cross pollination of this dynamic and democratic form—word and voice. To capture this three-day convening in the fall, AIR Serenbe commissions a local filmmaker to create an original short film about the meeting of the minds and mouths. The Here Say 2018 convening will be November 5-8, with a public performance in Atlanta on November 7. Watch the Here Say 2017 film, created by filmmakers Jake and Isaac Gee, at airserenbe.com/filmer/2017. National Endowment for the Arts Chairman Jane Chu has approved more than $25 million in grants as part of the NEA’s first major funding announcement for fiscal year 2018. The Art Works category is the NEA’s largest funding category and supports projects that focus on the creation of art that meets the highest standards of excellence, public engagement with diverse and excellent art, lifelong learning in the arts, and/or the strengthening of communities through the arts. Each year, more than 4,500 communities throughout the United States benefit from NEA grants. Visit airserenbe.com to learn more about AIR Serenbe. Visit arts.gov to learn more about NEA. 2017 Here Say artists after performance at Cherry Hollow Farm. Shira Erlichman, Cristin O'Keefe Aptowicz, Anis Mojgani, Eve Ewing, Derrick Brown, Bright Son, Dame Wilburn, and Ray Christian. 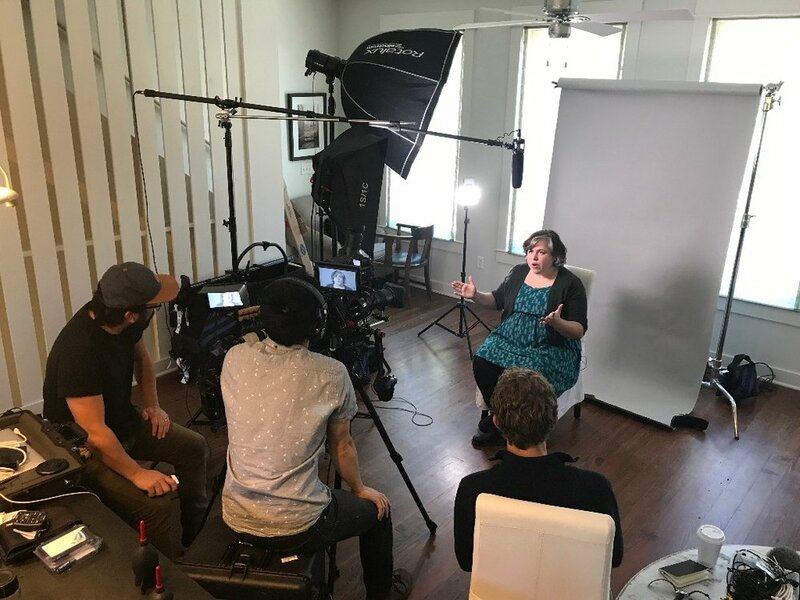 Cristin O'Keefe Aptowicz speaking on camera about the power of words in growing up. With Grady Powell of Openfields and filmmakers Jake and Isaac Gee. AIR Serenbe, the artist in residence program in Chattahoochee Hills, GA, is a member of the Alliance of Artists Communities and an affiliate of the Serenbe Institute for Arts, Culture & the Environment. AIR Serenbe is supported in part by the Fulton County Commission under the guidance of Fulton County Arts & Culture, the Georgia Council for the Arts through the appropriations of the Georgia General Assembly, and GCA’s partner agency—the National Endowment for the Arts.